The setup of the game could have been better. For starters, Monopoly and Yahtzee aren't playable at all using Single-Card Download. It's understandable that the sheer quantity of animations in Monopoly make it too large to download, but Yahtzee? It also seems like several extra steps are needed to complete the setup than there should be. 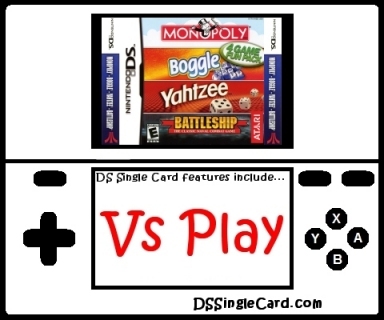 There is a "Hot Seat" mode allowing multiple people to play Monopoly and Yahtzee without requiring multiple copies of the game, but you are required to pass the same DS arround. Getting past the lack of Monopoly and Yahtzee, most of the menus aren't bad. The main menu consists of four tap-able logos. The Battleship menu has four options, all of which are clearly outlined and separated. The Boggle menu started as a nice idea - have all of the options spelled out on staggered Boggle dice with Boggle dice raining in the background - but the execution means the selections are too close together (on the main Boggle menu) and you may end up tapping the wrong option. The raining Boggle dice in the background are slightly distracting. On the other hand, all menus are maneuverable using the the direction pad and the "A" button. Ease of use on Boggle couldn't be better. You can literally "draw" or "trace" the word you see almost as quickly as you can think it. If you let go and trace something else, just trace it again - there's no delay. It will automatically reject a word after it's already been entered, so you'll know if you already got it. In Battleship, once you get used to spinning the ships during deployment, it becomes easy. The small squares can be a little small to remainacurate on, but it's because they had to get a certain number of them on the screen. If you're having trouble aiming, use the direction pad and the "A" button instead. The game gets a big markdown here because of the lack of Yahtzee more than anything else. As stated above, the reasons for omitting Monopoly are understood, but not for Yahtzee. The single-player version has six different graphic sets and three rule set variations that are not available in Single-Card Download mode, and while they're not necessary, they'd have been nice. Other than its menus, Boggle couldn't have been more well set up. The dictionary could have been a little more thorough. Battleship's graphics are excellent and precise. Gameplay on both games is smooth and the background music and sound effects (on the host's Nintendo DS), while repetitive, are not overly destacting. There is no sound whatsoever coming of of guests' Nintendo DS systems. If the one-sided sound bothers you, just turn off the sound and prepare to talk some serious smack. I'm disappointed that only 2 of the 4 games have Single-Card download, and I particularly don't understand why Yahtzee was excluded. Great detail was put into the look of the game, which explains why no sound comes from guests' Nintendo DS systems. (In truth, how far away are you that you couldn't hear if it was that important?). Boggle was easier and more intuitive than the real-life game and the problem with Battleship (small board spaces) is no more annoying that messing with the little red and white pegs that stay where they're supposed to only sometimes. Monopoly/Boggle/Yahtzee/Battleship is not a title to play for countless hours on end, but it's one that'll keep showing back up, expecially when there are casual video gamers around. Monopoly: Make a graphically-simplified version for Single-Card download. Boggle: Simplify the menu, improve the dictionary, and allow more than 4 players. Yahtzee: Add in Single-Card Download!!! Battleship: Allow the alternate rules and alternate graphic sets.